Music transcends age. It is a timeless art that continually touches the soul of anyone who listens. Being of the younger crowd in this packed theater, I was not sure how the story of Carole King would resonate with me. Oh, boy was I in for it! 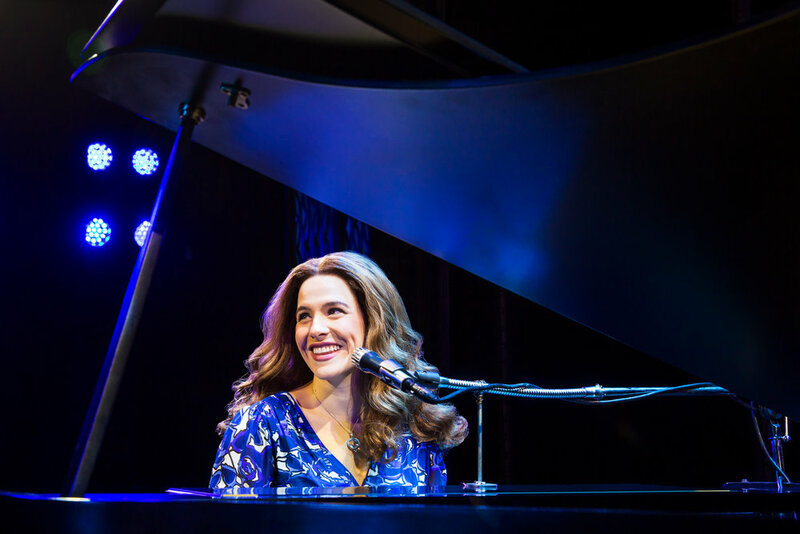 Beautiful – The Carole King Musical focuses on the early life and career of the legendary and groundbreaking singer/songwriter. Under the direction of Marc Bruni, Beautiful encompasses love, heartbreak, friendship and freedom. Carole King, chart-topping music legend was born Carol Klein, a girl from Booklyn with fiery passion. She fought her way into the record business as a teenager and, by the time she reached her twenties, had the husband of her dreams and a flourishing career writing hits for the biggest acts in rock ‘n’ roll. It’s not until her personal life begins to crack that see finally managed to find her true voice. “Carole King might be a native New Yorker, but her story of struggle and triumph is as universal as they come – and her music is loved the world over,” producer Paul Blake said. King wrote the soundtrack to a generation. Beautiful features a stunning array of beloved songs written by Gerry Goffin/Carole King and Barry Mann/Cynthia Weil, including “I Feel The Earth Move,” “One Fine Day,” “(You Make Me Feel Like) A Natural Woman,” “You’ve Got A Friend” and the title song. With a book by Tony® and Academy® Award-nominee Douglas McGrath and choreography by Josh Prince, this work stands out as a reminder the old saying “you can’t have a rainbow without rain” is entirely true. Sarah Bockel has a contagious smile and delivers such fast talking quips that keeps the audience laughing. The personal traits Bocknel conveys evokes a strong connection with the audience when those smiles start to waver in the face of tribulation. We are tied to King’s story from the moment we sit down in the theater. A strongly feminist piece, King was raised in a one parent household and Suzanne Grodner as King’s mother Genie Klein is remarkably hilarious. Grodner captures the spirit of a feisty, yet traditional mother with relatable dry humor. With a reluctant encouragement from her mother, King’s brash determination lands her a dream job as a composer in the offices of Don Kirsher, American music publisher, rock music producer, talent manager, and songwriter. Known as The Man with the Golden Ear, Kirsher is played by the extremely talented and well versed James Clow, who holds credits from Broadway like White Christmas, Wonderful Town, Company and more. The never-ending wit in this piece is so straight forward that it comes across as refreshingly realistic and not dramatized for the sake of performance. One gets lost in the down-to-earth satire that Jacob Heimer cracks as composer Barry Mann. The set design by Derek McLane is enchanting. Brown beige squared movable walls mimic the fashion and architecture of the 40’s/50’s, but also serve as a visual likeness of amps and stereo systems. There is a stark contrast between these muted tones and the vibrant colors and lights of showbiz in the plethora of musical numbers. From The Shirelles to The Drifters, each musical interlude is dazzling. The ensemble shines with a solid foundation to the lead characters that makes this production seem so full. The Drifters are depicted by the insanely talented Josh A. Dawson, Jay McKenzie, Avery Smith and Kristopher Stanley Ward. The costuming of these music groups is to die for! Alejo Vietti incorporates live quick changes on stage and dual costuming that is a mastery to her craft. The subtle evolutions in fashion are lovely in the challenge to capture the changes of little over a decade. Peter Kaczorowski wows with his lighting design for these large glitzy sequences, as well as his complete finesse for spots on characters while the rest of the grid turns to a darker tone during narrative drama. A wonderfully dynamic scene is created through McLane’s layering of space with Kaczorowski’s control of luminescence. A holistic time machine of a production showcasing the inspiring true story of Carole King’s rise to stardom holds universal themes regarding relationships, friendships and self-love. As a young woman, I can honestly say this work is something everyone can identify with no matter the age or knowledge of King and her many vast accomplishments. This production illustrates that nothing is ever as easy as we think. It takes hard work and in order to be strong, you have to realize and accept what you can’t change… and more importantly what you can. Sarah Bockel as Carole King. Photos by Matthew Murphy. The Shirelles. (l to r) Traci Elaine Lee, McKynleigh Alden Abraham, Alexis Tidwell and Ximone Rose. Photo by Matthew Murphy. James Clow (Don Kirshner), Andrew Brewer (Gerry Goffin), Sarah Bockel (Carole King), Jacob Heimer (Barry Mann), and Sarah Goeke (Cynthia Weil). Photos by Matthew Murphy.